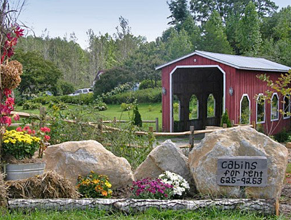 Stoney Creek Farm has a charming 1905 farmhouse and fully equipped rustic cabins for your enjoyment in the Blue Ridge Mountain area of Western North Carolina. It is a great place for family reunions, weekend golfers, or a family with children. You can enjoy nature walks among wildflowers and pick raspberries on several acres, enjoy the little creek area to pan for gems, relax on the porch watching the horses graze on the hills nearby, and enjoy the sunset over Young’s Mountain with a glass of wine. Western North Carolina is home to the great smokey mountains, pisgah forrest and blue ridge parkway.